Robert E. Lee had Traveller and Stonewall Jackson his Little Sorrel. Bedford Forrest rode King Philip, and that other famed Confederate cavalryman, John Hunt Morgan, had Black Bess. When I was in college at Emory, the late great Professor Bell Wiley gave me a leaflet, “The Ballad of Black Bess,” which the director of the University of Kentucky Press had given him. Say what you will about George McClellan– a great organizer, though timid in combat; beloved by his soldiers though a bane to Lincoln’s cabinet. Or maybe you’re an avid McClellan devotee, who defends the Young Napoleon to any passerby you come into contact with. 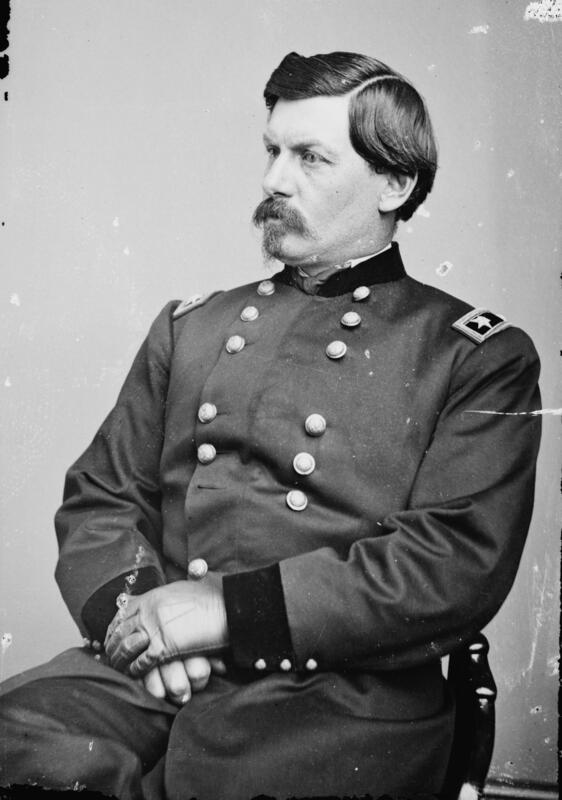 No matter what camp you fall into, the Library of Congress has recently digitized and made available online McClellan’s papers. They are to, to state the obvious, a goldmine of material. In June 1862, John Pope assumed command of the Eastern Theater’s newest army made up of disparate forces – the Army of Virginia. Unfortunately, Pope’s strong ego and dislike for the Army of the Potomac’s popular commander George B. McClellan (at least with the soldiers) placed him at odds with much of his own command. Nonetheless, he hoped to bring a Union victory to the East, specifically in northern Virginia. To accomplish this mission, he needed to control the region. An engraving showing the Army of Virginia’s occupation of Warrenton, Virginia in 1862. The army utilized strict policies to counter guerrilla warfare and spying. Courtesy of the Library of Congress. It’s a dilemma. We have a lot of articles about Chancellorsville in our archives and a two-part podcast about the battle. How can we share the most? As they were rivals in life, so, too, it seems, did senators Henry Clay and John C. Calhoun try to outrival each other in death—or at least their supporters did. In 2014, as part of a post I wrote about Calhoun-related sites in his home city of Charleston, South Carolina, I mentioned the towering Calhoun monument on the edge of Marion Square. A statue of Calhoun stands atop a granite column measuring 80 feet high. Original CDV of John Pope, between 1863 and 1865. Courtesy of Frohne’s Historic Military. Last week’s question opened a discussion about significant battles or skirmishes in the Peninsula Campaign, but excluded the Seven Days Battles. Now, in you opinion which battle during the Seven Days was most significant and important? Why? Wishing you a blessed weekend to celebrate Passover, Easter, or just good times with family and friends! It’s been an adventurous week on the blog. We started off with articles to inspire your summer travels, then headed into 1861 “marching off to war” history, and wrapped up with a full day of preservation discussions – along with other articles and topics along the way. LeRoy Wiley Gresham’s diary offers remarkable insight to an invalid’s life, the reporting of news on the homefront, culture and literature, and medical practices. The Georgian teenager found himself suffering from a cruel disease that racked his body and worsened as the years passed. While other boys his age hated their school studies, dreamed of enlisting, or got packed off to boarding or military schools, LeRoy saw the war pass “outside my window” and created a written record of his painful days, literary habits, visitors, and opinions on the conflict. Today is Easter Sunday, and I wondered what LeRoy had to say about the sacred celebration through the years of the Civil War. He and his family were religious and attended the Presbyterian church regularly, and at various points in his journal LeRoy writes about ministers, chaplains, and his own studies of the Bible. What if we could compare all his entries on the four Easter Sundays of his life and the war? What would we learn?